Which Foods Contain The Most Zinc? Zinc is a key element for healthy body immunity due to its involvement with the T cells. According to the Food and Agriculture Organization’s Human Vitamin and Mineral Requirements document, over 300 biochemical reactions involving enzymes that are essential for various metabolic processes involve zinc. The human body requires many minerals, among which zinc is an important and indispensable one. As per the International Zinc Association, a normal adult human body contains about 2-3 grams of zinc; about 90% of zinc is found in the bones and muscles. 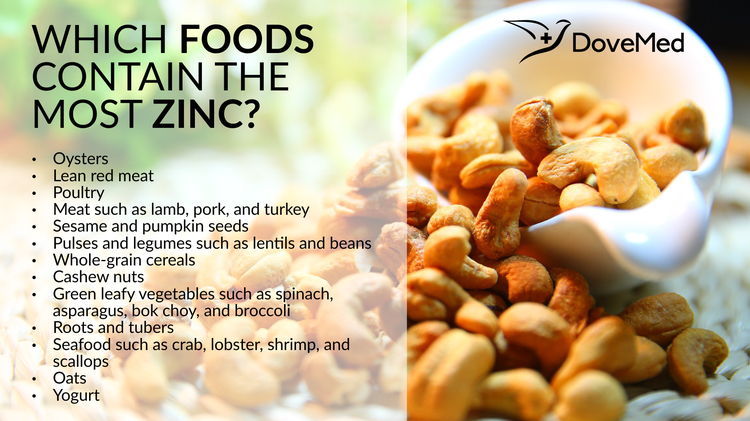 Including sources of zinc in a regular diet that consists of meat, legumes and beans, whole grains, leafy green vegetables, roots and tubers, and seafood may make-up for the body’s requirement of nutritional zinc. Zinc is required in small quantities, and it is hence called a trace mineral. Zinc also plays a key role in many body functions. Zinc is a key element for healthy body immunity due to its involvement with the T cells. According to the Food and Agriculture Organization’s Human Vitamin and Mineral Requirements document, over 300 biochemical reactions involving enzymes that are essential for various metabolic processes involve zinc. The synthesis and degradation of carbohydrates, lipids, proteins, and nucleic acids depend on these reactions. Zinc is essential for the growth of a fetus during pregnancy. During the growth phase of a child, zinc in food is vital for physical growth and development. In women, foods high in zinc can lessen the symptoms associated with menstruation. In men, zinc is used to control fertility issues involving poor sperm count and abnormal testosterone levels. According to the US National Academy of Sciences Food and Nutrition Board, the recommended dietary allowance (RDA) of zinc for teenage boys and men is between 8-11 milligrams/day; for teenage girls and women, the requirement is between 8-9 milligrams/day. Different age groups have different zinc requirement quantities. The RDA during pregnancy is 11 milligrams/day and higher at 12 milligrams/day for lactating mothers. Zinc deficiency may occur on account of gastrointestinal diseases, in individuals who are suffering from sickle cell disease, in vegetarians, those who abuse alcohol, and in women who are pregnant or breastfeeding. Excess zinc can interfere with copper levels in the body (copper levels get lowered) and cause neurological conditions. There are many dietary supplements that contain zinc including certain medications for the common cold. However, the use of such supplements should be under prescription only. It is always recommended to take the advice of a suitable healthcare professional before bringing any alteration to your regular food habits and diet. Lönnerdal, B. O. (2000). Dietary factors influencing zinc absorption. The Journal of nutrition, 130(5), 1378S-1383S. White, P. J., & Broadley, M. R. (2009). Biofortification of crops with seven mineral elements often lacking in human diets–iron, zinc, copper, calcium, magnesium, selenium and iodine. New Phytologist, 182(1), 49-84. Brown, K. H., Wuehler, S. E., & Peerson, J. M. (2001). The importance of zinc in human nutrition and estimation of the global prevalence of zinc deficiency. Food and Nutrition Bulletin, 22(2), 113-125. Welch, R. M., & Graham, R. D. (2004). Breeding for micronutrients in staple food crops from a human nutrition perspective. Journal of experimental botany, 55(396), 353-364. Maret, W., & Sandstead, H. H. (2006). Zinc requirements and the risks and benefits of zinc supplementation. Journal of Trace Elements in Medicine and Biology, 20(1), 3-18.